The end of my second-to-last semester in grad school is finally in sight. Relief and time off are just a few weeks away! We have been so busy this semester. Notice I said “we” and not “I.” Even though Neil isn’t in school, he is often the innocent bystander who falls victim to my coursework. Our meals and evenings are dictated by my obsessive need to collect every class participation point and finish every project to the point of clinical excess. Toss in several freelance projects and it was only a matter of time before we hit burnout, and it feels like a brick wall. I’ve spent my entire week working on a project for my Flash class. We are just entering the nuances of advanced Actionscript and I’m just not taking to it well. It doesn’t help that our project requirement is a crazy assemblage of animations, video and audio over several frames that have to be coded to play on page load, and turn on/off when someone interacts with a feature and link between screens with required input fields and colors and GAH! It’s a mess, and I have spent nearly every non-working hour for the last five days doing triage in order to make it work. And it does work, kind of. I finally had to cut myself off. You know that point where you’ve put so much into it that you have nothing left to give? I mean nothing left to give. I’m there. All this work and time away from what felt like a balanced existence have made us homesick for my second hometown of Springfield, Missouri. We love going down there to visit family and friends, but with my schedule this semester I haven’t been able to visit since Christmas. If you’re not familiar with Springfield, there are two words that are almost synonymous with it: Cashew Chicken. There are tons of Chinese restaurants in Springfield. It’s a running joke that on every block you’re sure to find a church (bible belt), a liquor store and a Chinese restaurant. Every one of them serves Cashew Chicken. I think it might be a requirement by the Better Business Bureau. Each restaurant has put their own spin on it, so the decision when we visit isn’t “where to go for dinner?” so much as what kind of Cashew Chicken we’re in the mood for. Canton Inn? Cashew In Cashew Out? Mr. Yen’s? So many choices, none of which were available to us last night. So we did what any desperate, homesick couple would do. We made it ourselves. 1. Wash and cut the chicken breasts into 1-inch pieces. In a shallow dish or bowl, mix together the flour, seasoning salt and 1 tablespoon of the cornstarch. In another dish or bowl beat egg and mix with water. 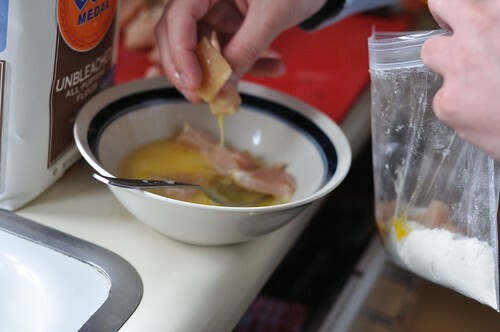 Dip chicken pieces into flour mixture, then eggs, then flour mixture again. 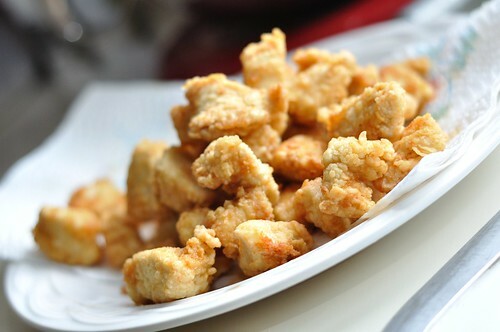 Heat peanut oil in a large skillet and deep fry coated chicken in hot oil for 3 to 4 minutes. Drain on paper towels. 2. Meanwhile (while frying chicken), heat broth to boiling in a medium saucepan. 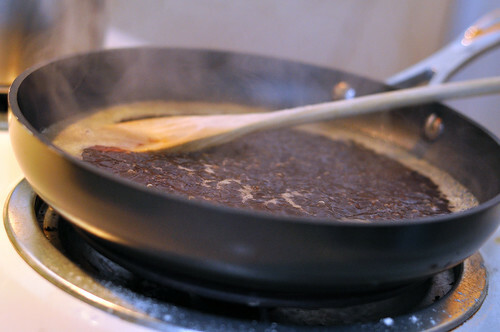 Add oyster sauce, sugar, soy sauce and white pepper and return to boiling Mix remaining cornstarch with a small amount of cold water in a cup. Add cornstarch mixture to broth slowly (almost drop by drop at times) and continue stirring, then cook for another 5 minutes over medium-low heat. 3. Preheat oven to 200 degrees F (95 degrees C). Place cashews on a baking sheet and bake for about 5 minutes. 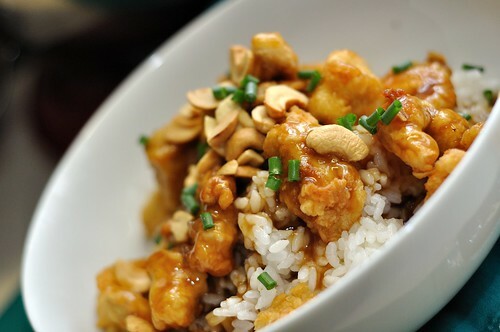 Pour sauce over fried chicken and prepared rice and top with cashews and green onion. 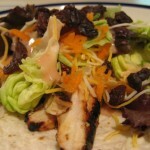 Serve with soy sauce to taste, if desired. 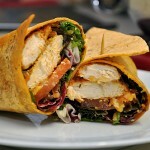 This recipe was spot on, even better than some of the restaurant varieties we’ve had in Springfield. Lightly crunchy chicken, smooth and lightly sweet sauce, with the taste of toasted cashews and fresh cut (right from our garden) chives mixed in. 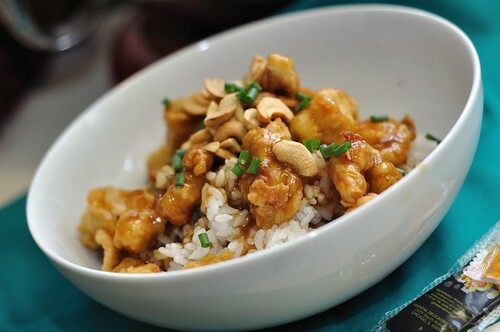 If you’ve never had Cashew Chicken, this easy recipe is the perfect way to become acquainted with a Springfield staple. It’s important to note though that it is definitely not an authentic recipe as far as Chinese food goes. Springfield-style Cashew chicken is very much your typical American-butchered Chinese take-out. 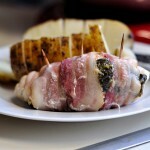 It is typically gooey, starchy, and very greasy. 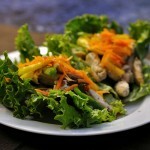 While this recipe is of the same approach, it’s composition is definitely healthier than its take-out counterpart. If you’re looking for a more authentic variation, I recommend Rasa Malaysia’s Cashew Chicken. 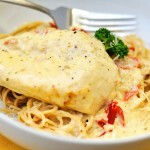 Update: Check out our meatless version of this dish! 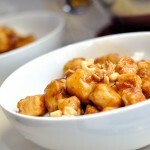 How About a Little Cashew Tofu? I should have that cooking soon in my kitchen! Did you know Wing Yee Leong opened Leong’s Asian Diner, 1540 W. Republic Road in Springfield? Why is this important? Well, Wing Yee is the son of David Leong, the man who created Springfield-Style Cashew Chicken and the restaurant serves the original recipe made the way only the Leongs can. Mr. Leong is about 90 now but he’s involved in the restaurant. Say hello if you see him there! I made this tonight and it was delicious! I preferred Hong Kong Inn’s General Chicken when I lived in SGF, but my wife was a cashew chicken girl. She loved your version! Thanks for putting this together. One question for you: the picture above of the sauce in the skillet… that’s not at all what ours looked like. We put it in a sauce pan like the directions said, and it didn’t have that brown crust. Did we do something wrong? Also, were we supposed to use all of the corn starch in the sauce? We just used enough to thicken as much as we wanted, but I’m curious how you did it. I do not think I had any cashew chicken in Springfield that I did not like, however some I liked better than others. There is only one place to my knowledge here in Columbia that has Springfield Style Cashew Chicken, and it is average at best. I miss it! The picture of the brown sauce is it boiling rapidly, however it does give the illusion that it has a crust (it does not). As far as the corn starch goes; corn starch is a funny beast and you really have to add it slowly and bring your sauce up to the thickness that you like. You also have to gauge that as the sauce cools it will become much thicker. It is almost impossible to provide a 100% accurate estimate on how much corn starch you should use. My advice to most people is to add slowly, lower heat, add more slowly and stop when you think “this is just a bit too thin”, because it will thicken up by the time you get it on the dish. I am glad you enjoyed the recipe! This reminds me to make this again soon. There is some good stuff here now, you just have to know where to go and what to say. Sometimes if you ask for a list of authentic items or recommendations, they are happy to do so!